For a limited time only! While Stocks last. Dolls not included! 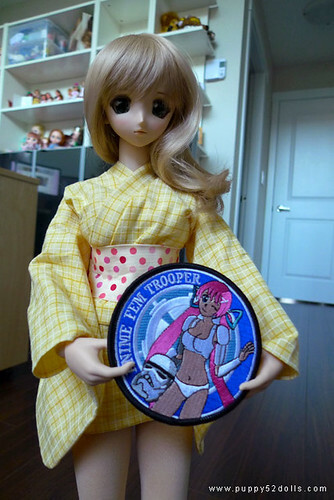 From my last post, some of you have expressed interest in buying my Anime Fem Trooper patch. Thus I have decided to set aside a couple of them just for you readers. Btw thanks to chun who took these pics of my patch with her lovely dolls. The one above is Mirai and the one below is Mirin. I am interested in one! But just wondering… don’t you automatically get our addy and stuff like that when we send you money through paypal? so there is kinda no need for another email to confirm our addy and ID ^^;. I can send you the money when I get home tonight. I guess ill be able to transfer the money around wednesday ot thursday.I didnt even know that there was an Paypal option to pay in S`Pore Dollars. i’ll take 2 patches then. what happens when your mum finds out about all those NSFW stuffs inside your computer? I mailed you a question! all e-mails are replied. Thank you all! 😀 am i too late ? If i’m not , i’ll get one too. is it too late to order one from u??? ya..could you give me your bank account number…transfers can be done at the atm right?? drop me an e-mail at gordon008 [@] yahoo [dot] com [dot] sg and i will give u more info.